You've all met Sparky before. I'm coming up on a year of ownership. When I first bought the car, it represented a big step in growing up. I was a car owner. Sparky first cut his (yes, it's gendered, Justin) teeth on the 3,000 mile drive over the western United States, a straight shot on I-80 from Iowa to San Francisco. I saw the fabled vast, empty stretches of the country zip by at 80 miles an hour (which, while less romantic than my long-held dream of doing it at 15 miles an hour on a bike, is much more romantic than seeing it from 30,000 feet). But at some point, the car came to represent rockin' it on 101, where "rockin' it" can better be interpreted as "getting stuck in traffic." I had become a (shutter) freeway commuter. My car turned, in my mind, into a lame-mobile, a relic representing the stifling suburbs of the south bay. 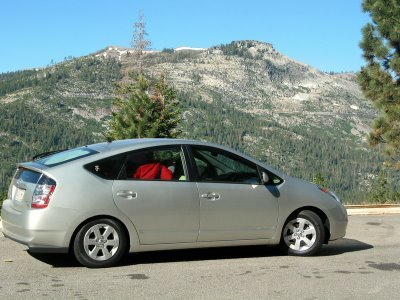 When I moved to San Francisco, my car didn't make the trip. It lived at work, in the parking garage, where I would occasionally take it in place of the shuttle. There are two options for it: sell it, or rent a garage space. A garage space seemed like such an extravagence. Pppt. Parking should be free, like water or air. I don't need one. I can become one of the snotty, carless hipsters—we transcend car ownership. So, this was Memorial Day weekend, right? I drove my car up Friday night and have been travelling the (much) greater Bay area all weekend. Saturday: Camden, Point Reyes. Sunday: Justin, Berkeley hills. Monday: Joanna, Stinson and Muir. I always have this issue: the sprawling mass of development known as the Bay Area seems so extensive, I forget that it's surrounded by some of the most beautiful natural areas in the country, which remain largely undeveloped. I forget about them because they're not accessible by MUNI or BART. And so "car," in my mind, has shifted from a confining concept to a enabling one. My car isn't a trap, it's an escape from urban life, from monitors, keyboards, and ethernet cables. So, I love my car again. I'm getting a garage space. You could just get your S permit and park on the street ... you just need to move it once a week for street cleaning. Free and you get to keep your car! Are you paying more for the cars parking the the dormitory costs at college? i fell in love with a car once. yeah... me and my baby went everywhere together. that was until the same car that i love so much nearly killed me after something unexplainable happened to the engine. thats when i learned that a car does not love you back. so what i did was i went to webdate_dot_com and searched for a guy to call my own. at least i'm now with someone who loves me right back. lol!